code = convenc(msg,trellis) encodes the binary vector msg using the convolutional encoder whose MATLAB trellis structure is trellis. For details about MATLAB trellis structures, see Trellis Description of a Convolutional Code. Each symbol in msg consists of log2(trellis.numInputSymbols) bits. The vector msg contains one or more symbols. The output vector code contains one or more symbols, each of which consists of log2(trellis.numOutputSymbols) bits. code = convenc(msg,trellis,puncpat) is the same as the syntax above, except that it specifies a puncture pattern, puncpat, to allow higher rate encoding. puncpat must be a vector of 1s and 0s, where the 0s indicate the punctured bits. puncpat must have a length of at least log2(trellis.numOutputSymbols) bits. code = convenc(msg,trellis,...,init_state) allows the encoder registers to start at a state specified by init_state. init_state is an integer between 0 and trellis.numStates-1 and must be the last input parameter. [code,final_state] = convenc(...) encodes the input message and also returns the encoder's state in final_state. final_state has the same format as init_state. 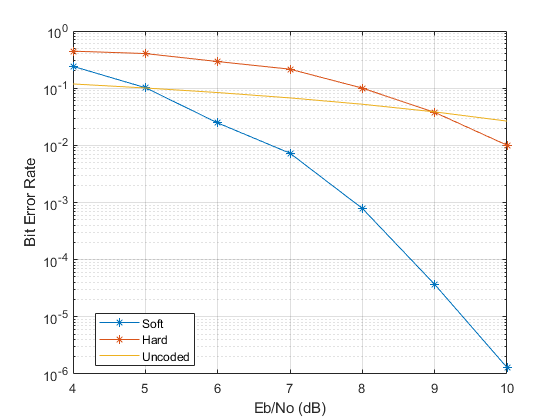 Encode five two-bit symbols using a rate 2/3 convolutional code. Verify that the encoded output is 15 bits, 3/2 times the length of the input sequence, data. Define the encoder's trellis structure explicitly and then use convenc to encode 10 one-bit symbols. Use the final and initial state arguments when invoking convenc. Encode part of data , recording final state for later use. Encode the rest of data, using fstate as an input argument. Verify that the [code3; code4] matches code1. Create a trellis structure for a rate 1/2 feedforward convolutional code. Use the trellis to encode and decode a random bit stream. Create a trellis structure. Set the constraint length to 7 and specify the code generator as a cell array of polynomial character vectors. Generate random binary data, convolutionally encode the data, and decode the data using the Viterbi algorithm. Verify the decoded data has no bit errors.